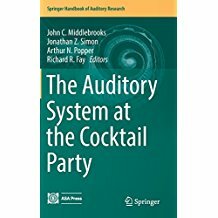 Professor Jonathan Simon (ECE/ISR/Biology) is an editor of the new book, The Auditory System at the Cocktail Party, published by Springer. In addition to Simon, the editors include John Middlebrooks, Arthur Popper and Richard Fay. Chapter authors include Simon, Matthew Goupell (Hearing and Speech, BSOS, NACS); and alumna Mounya Elhilali (ECE Ph.D. 2004), now on faculty at Johns Hopkins University in Baltimore. The book is part of the Springer Handbook of Auditory Research series, which presents synthetic reviews of fundamental topics dealing with auditory systems. Each volume is independent and authoritative; taken as a set, the series is the definitive resource in the field.